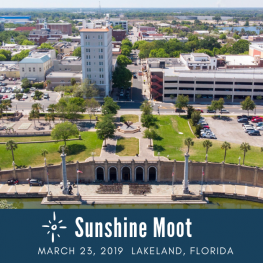 Join Signum University on March 23, 2019, in balmy Lakeland Florida for Sunshine Moot, a one-day conference on the intersection of the arts and mythic worlds. The Mythgard Institute at Signum University is pleased to announce the first annual Sunshine Moot! Located in balmy Lakeland Florida, Sunshine Moot 2019 will focus on the intersection of the arts and mythic worlds. Special presentations include visual art, music, and of course, the Tolkien Professor – Dr. Corey Olsen – himself. We are inviting you to pull back the dreary grey-rain curtain of winter and join us in sunny Florida for this one-day event of entertainment, art, and academic discussion. Sharon Hartman – Special musical guest: Attendees will be graced with the wonderful fiddling talents of Sharon Hartmann (from local acts like Just Twistin’ Hay and The Barnstorm Quartet) for an Elevensies concert where lunch will be provided (vegetarian options are available). The full schedule is still being developed. Watch for updates! The registration fee is $50 per person and includes a boxed lunch (choice of turkey sandwich, ham sandwich, or vegetarian Mediterranean sandwich). We are accepting proposals now for short presentations that will facilitate group engagement. We are particularly interested in presentations that center on the intersection of the arts and mythic worlds. This concept is not exclusive to Tolkien, but is also present in many works of science fiction and fantasy literature, films, and television. Please include your name, email address, and academic affiliation (if any), along with the title of your presentation. Individual presentations should be around 20 minutes long while leaving an additional 10 minutes for discussion, so please plan accordingly. Acceptances will be sent by March 2,, 2019. We look forward to hearing from you and hope you can enjoy the symposium with us! Sunshine Moot 2019 will be held in the basement of Catapult Lakeland, located at 331 S. Florida Ave, Lakeland, FL, 33801. Important: Please do not park in the Bank of America parking lot. A parking map is available here. We strive to host an inclusive, accessible event that enables all individuals to engage fully with Sunshine Moot. There is an elevator available for your use in the front entrance of the Bank of America building. This will take you directly to the hallway in front of the meeting room. If you have any questions or concerns, please do not hesitate to reach out to us directly. Sunshine Moot is a regional literature and language conference hosted by Signum University in sunny Florida. If there is sufficient interest, we will offer a tabletop/Dungeons and Dragons session on Friday night before the moot. This will be an informal gathering, designed to facilitate connection between conference members. It is not hosted by Signum University. Please let the moot organizers know when you register if you are interested in attending! Also, if there is sufficient interest, we will coordinate a meetup at The Wizarding World of Harry Potter at Universal Studios, Orlando on Saturday. This will be an informal gathering, designed to facilitate connection between conference members. It is not hosted by Signum University. Attendees will be responsible for their own ticket prices, travel, and other expenses. Please let us know when you register if you are interested in attending! Join Us at Sunshine Moot!